Vicente Carducho (1576–1638), Ordination and First Mass of Juan de Mata (date not known), oil, dimensions not known, Museo Nacional del Prado, Madrid, Spain. Wikimedia Commons. In the previous article of this pair, I looked at a few paintings by artists of the Spanish Golden Age, from El Greco to Zurbarán. Here, I concentrate on four painters: two who were reported to have taught Velázquez, the Italian Vicente Carducho who preceded Velázquez in the Spanish royal court, and Murillo who could be considered to be Velázquez’ successor. Older accounts of the training of Velázquez claim that he started in the workshop of Francisco Herrera the Elder (1576–1656) in Seville, but that he didn’t stay there long, apparently being frightened away by his master’s temper. 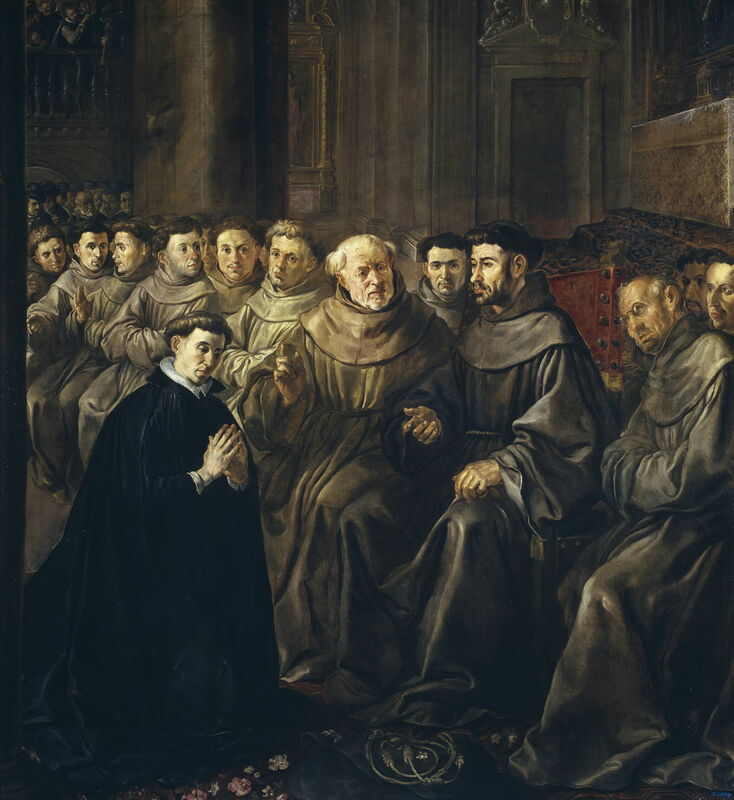 Francisco Herrera the Elder (1576–1656), Saint Bonaventure Receiving his Habit from Saint Francis (1628), oil on canvas, 231 x 215 cm, Museo Nacional del Prado, Madrid, Spain. Wikimedia Commons. Herrera is less well-known today, and almost all his surviving and accessible works are religious. Among them is this austere account of Saint Bonaventure Receiving his Habit from Saint Francis which he painted in 1628. 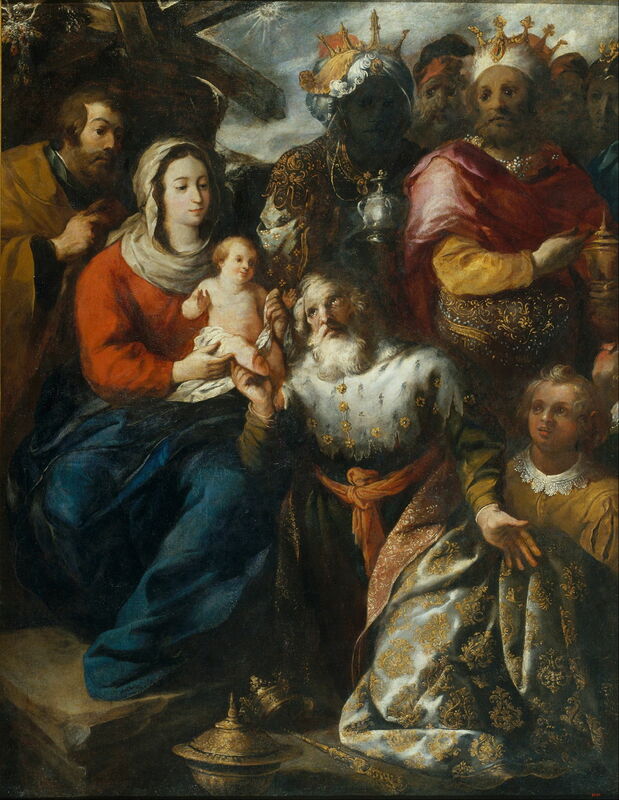 Francisco Herrera the Elder (1576–1656), Epiphany (1653), oil on canvas, 208 x 164.5 cm, Museu Nacional d’Art de Catalunya, Barcelona, Spain. Wikimedia Commons. Herrera painted this Epiphany in 1653, which bears comparison with that of Rubens (shown in the previous article) from almost twenty-five years earlier. Although known as the founder of the School of Seville, I suspect that Herrera would have been outstripped by Velázquez fairly quickly. Documentary evidence shows that the young Velázquez completed a five year apprenticeship in the workshop of Francisco Pacheco (1564–1644), who later became his father-in-law. Pacheco has been compared with the great Italian biographer of artists Vasari, as they both appear to have been very knowledgeable about painting and painters, but neither seems to have achieved particular success in their art. Pacheco visited Madrid and Toledo in 1611, to study the work of El Greco and others. His most impressive painting is his Last Judgement (1614) now in the Goya Museum, which sadly is only accessible in very low resolution. He wrote a book, The Art of Painting, which was published in 1649. Francisco Pacheco (1564–1644), Christ Served by Angels in the Desert (1616), oil on canvas, 268 x 418 cm, Musée Goya, Castres, France. Image by Aristoi, via Wikimedia Commons. 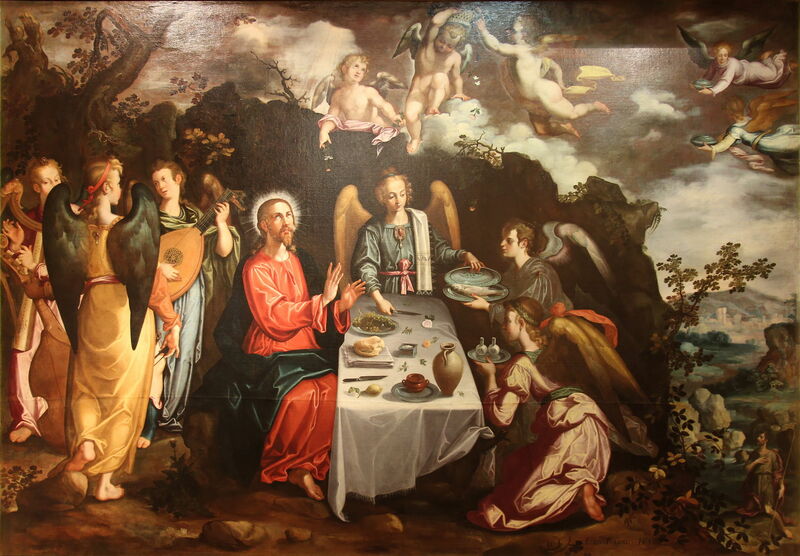 Christ Served by Angels in the Desert from 1616 is unusual for its table detail, but this is no bordegone. It looks quite ancient for its date, and reflects intense conservatism in Pacheco’s painting. 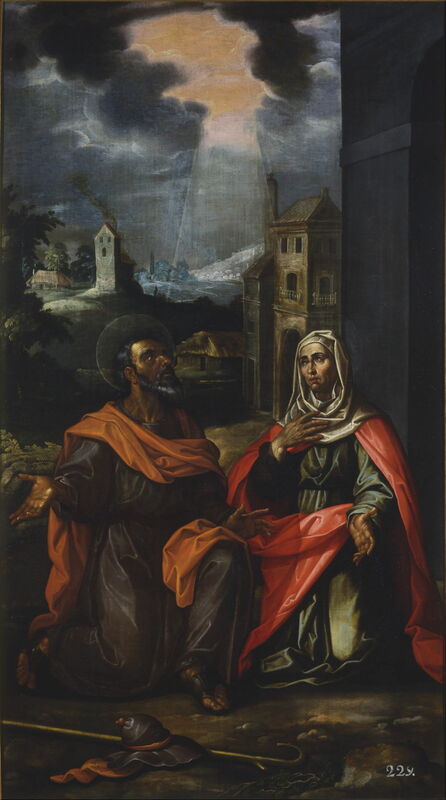 Francisco Pacheco (1564–1644), Saint Joachim and Saint Anne (c 1617-20), oil on canvas, 148 x 83 cm, Real Academia de Bellas Artes de San Fernando, Madrid, Spain. Wikimedia Commons. Pacheco’s Saint Joachim and Saint Anne from about 1617-20 is decidedly Tenebrist, and his figures more realistically modelled. It shows the apocryphal parents of the Virgin Mary in an unusual landscape which has Netherlandish influence. Pacheco’s book is also something of a curiosity. To avoid offending royal support, it goes out of its way to defend the loose style of one of the royal favourites, Titian, but is implicitly critical of Velázquez’ painterly approach. Fortunately it was published late in both their careers, so its immediate impact was limited. That wasn’t the case for Velázquez’ great rival at court, the Italian Vicente Carducho or Vincenzo Carducci (1576–1638). He was born in Florence, and travelled to Spain as a boy, where he trained under his brother, Bartolomeo Carduccio (1560-1608). He established his reputation when working with his brother to paint works for Philip II and III of Spain; his brother died young, and he continued alone from 1608. After painting a history of Hercules for Philip III, he worked for the monks of the Chartreuse of el Paular near Madrid, where in four years he completed a spectacular series of 54 canvases for them. He then worked for King Philip IV. Vicente Carducho (1576–1638), The Vision of Dionisio Rickel, the Carthusian (1626-32), oil on canvas, 336.5 × 297.5 cm, Museo Nacional del Prado, Madrid. Wikimedia Commons. 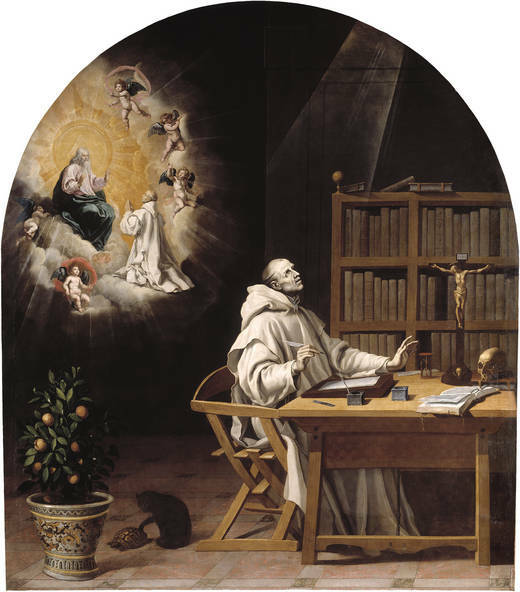 In Carducho’s The Vision of Dionisio Rickel, the Carthusian from 1626-32, he shows the pious and ascetic Carthusian monk who wrote more than 150 works, including a complete Bible commentary. Dionisio Cartujano (1402-1471), or Denys van Leeuwen, or Denis de Rickel, or Denis the Carthusian, was also responsible for building a monastery in ‘s-Hertogenbosch when Hieronymus Bosch was a young man there. A black cat is playing with a tortoise, hinting strongly at allegory. If the cat represents the devil, the hard-shelled tortoise might indicate invulnerability to the wiles of the devil, perhaps. Vicente Carducho (1576–1638), The Apparition of the Virgin to the Dying Pedro Faverio (1624-34), oil on canvas, 57.2 x 48.3 cm, Museum of Fine Arts, Houston, TX. Wikimedia Commons. 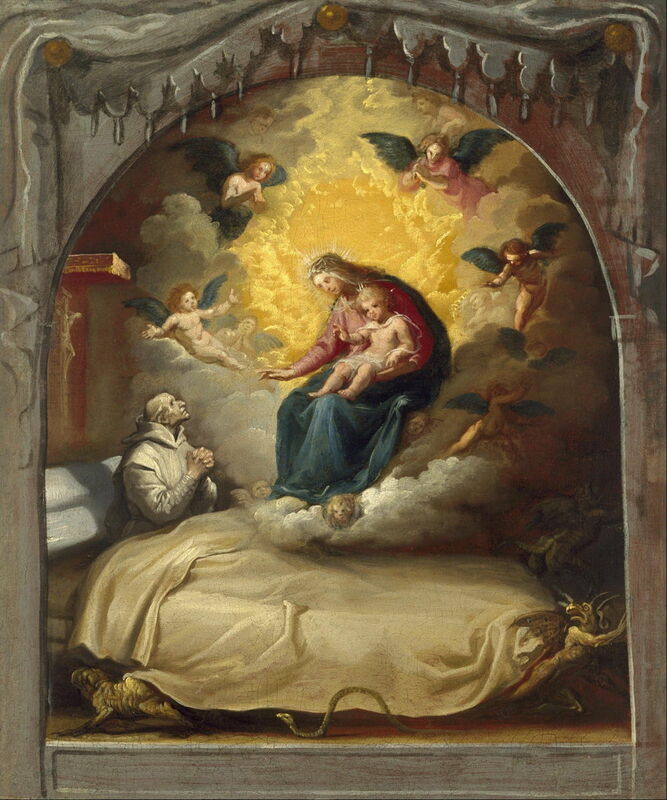 Painted at around the same time, between 1624-34, The Apparition of the Virgin to the Dying Pedro Faverio is another monk’s vision, this time a painting-within-a-painting. There are also several diabolic symbols taking flight from around the monk’s strangely double bed. 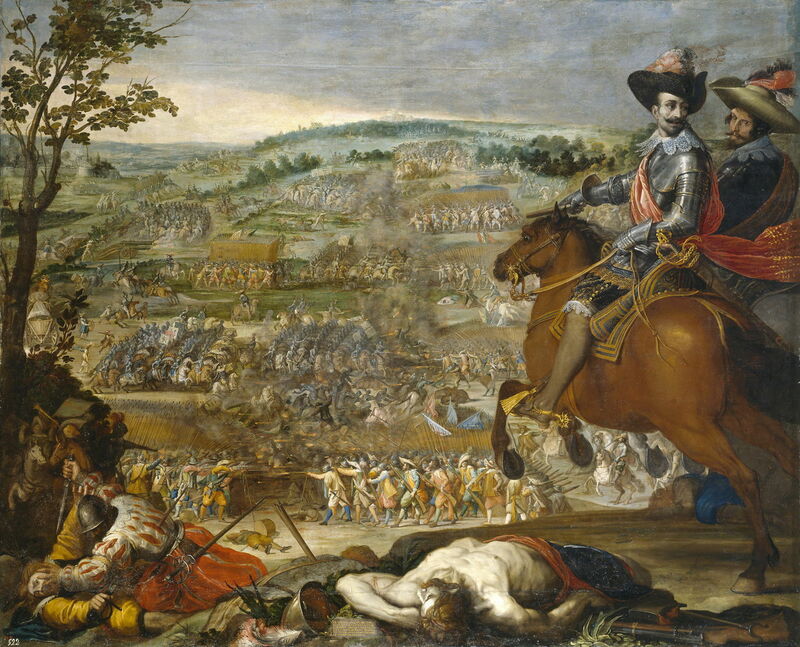 Vicente Carducho (1576–1638), The Victory of Fleurus (1634), oil, dimensions not known, Museo Nacional del Prado, Madrid, Spain. Wikimedia Commons. Carducho also made several history paintings to please the royal court, among them The Victory of Fleurus from 1634. This shows the battle which Spain had won at Fleurus in the Spanish Netherlands (in modern Belgium), over the army of the Dutch Republic, in 1622 during the Thirty Years’ War. Carducho adopts a curious geometric layout for the battlefield, and includes an equestrian portrait of the Spanish commander Gonzalo Fernández de Córdoba. Vicente Carducho (1576–1638), Allegory of Saint Ángel Custodio (date not known), oil on canvas, dimensions not known, la Ermita del Cigarral del Santo Ángel Custodio, Toledo, Spain. Image by David Blázquez, via Wikimedia Commons. Allegory of Saint Ángel Custodio is a magnificent tiered vertical composition which bears the influence of some of Tintoretto’s paintings then in Venice. Carducho starts with humans on earth at ground level, with their ‘guardian angel’, ascending to the Virgin Mary and (I think) Saint Francis in the heavens, topped by the Holy Trinity – a Catholic hierarchy. 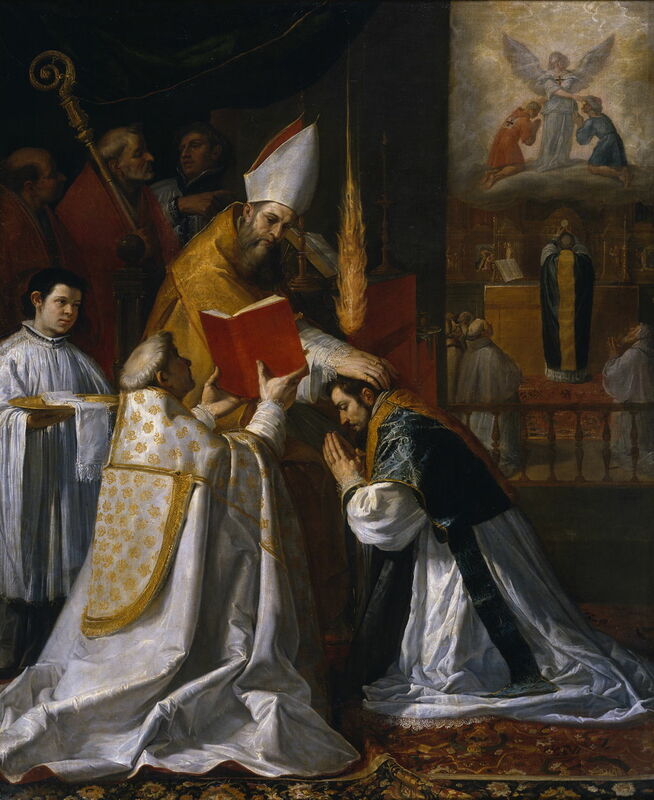 Carducho’s technical skill is apparent in this undated painting of the Ordination and First Mass of Juan de Mata. Fine detail and surface textures of the fabrics are particularly realistically painted. However, his complex composition and use of paintings-within-a-painting are less successful, despite his ingenuity. Vicente Carducho (1576–1638), Dialogos de la pintura : su defensa, origen, essecia, definicion, modos y diferencias (1633), printed book, Metropolitan Museum of Art, New York, NY. Wikimedia Commons. It was as well that, with Pacheco’s encouragement and advice, Velázquez established himself in the royal court within a year or two of the death of Rodrigo de Villandrando at the end of 1622. 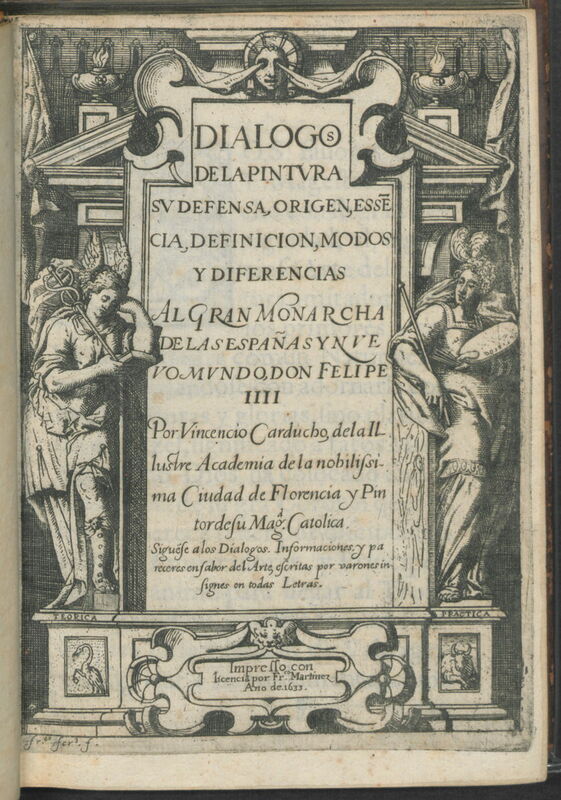 Carducho’s most important work wasn’t a painting at all, but his book on painting, Dialogos de la pintura : su defensa, origen, essecia, definicion, modos y diferencias which was published in 1633. Carducho singled out Caravaggio and the Tenebrists for his most severe criticism. He naturally praised the work of Titian, and by implication was more generous with his rival – already King Philip IV’s favourite painter – Velázquez. Until their rediscovery in the nineteenth century, Velázquez and his predecessors had been all but eclipsed by his successor, Bartolomé Esteban Murillo (1617–1682), who is far less well-known now. Murillo was also brought up in Seville, where he was training at the time that Carducho’s book was published. His early influences were Zurbarán and Ribera, and he probably didn’t see much of the work of Velázquez until he moved to Madrid in 1642. 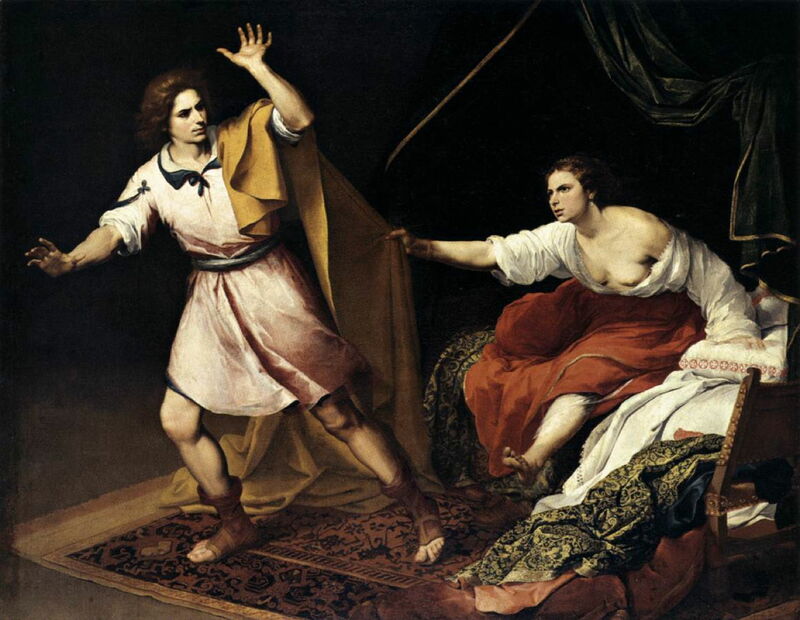 Painted for the cathedral in Seville, Murillo’s Joseph and Potiphar’s Wife (1640-45) is one of his first narrative works. This was strictly in accordance with the precepts of the Catholic Counter-Reformation in terms of its restraint in showing flesh. 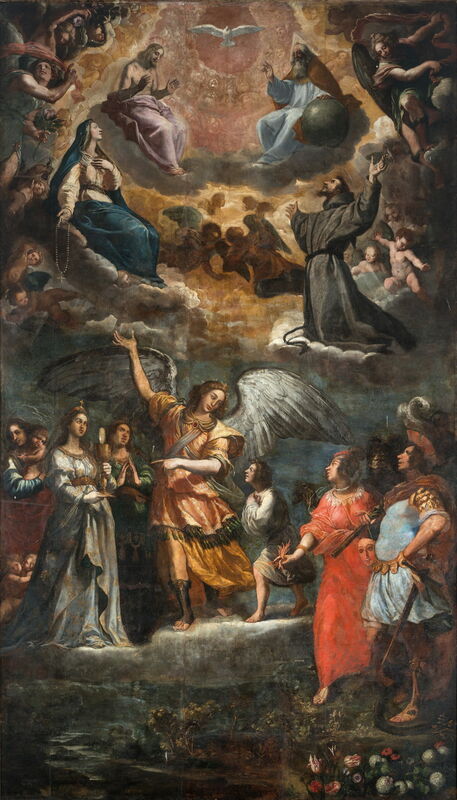 Murillo returned to Seville in 1645, where he was commissioned to paint eleven works depicting miracles of the Franciscan saints for the convent of Saint Francisco el Grande. 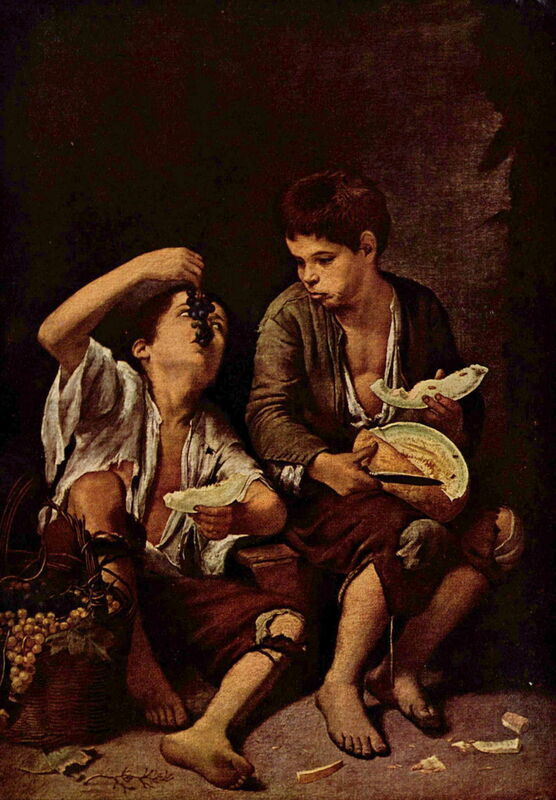 Murillo also started painting some more secular works, such as The Melon Eaters (c 1645-55). Concentrating his attention on the poor, he takes care to make their tatty clothes appear genuine, and their feet dirty. At the right is an older woman, who is wearing prominent pince-nez spectacles which look out of place. She too is plainly dressed, and sits with the head of a young boy on her lap. Her hands rest on his hair, as if checking it for nits and lice. The young boy wears the rough and tattered clothing of an urchin, the seat of his trousers torn open to reveal his buttock. His face is concealed, but the soles of his shoes don’t appear to be in a poor or worn state. 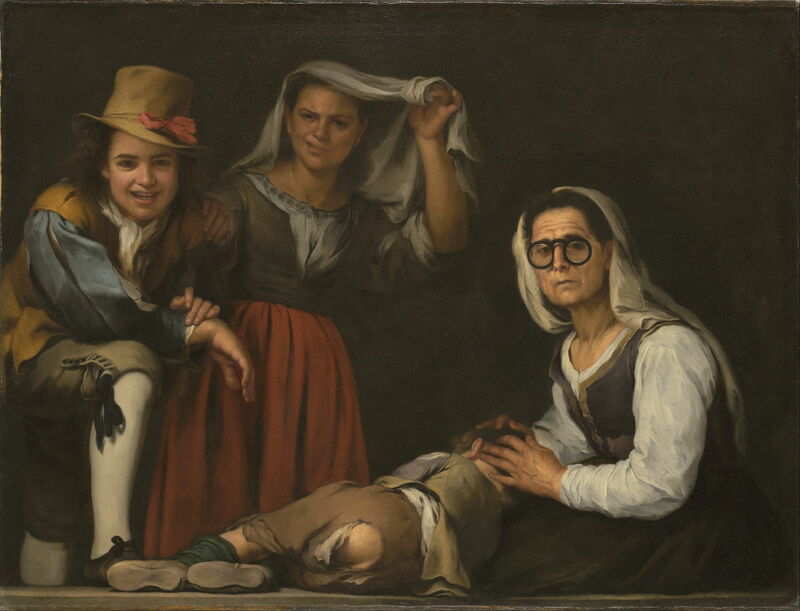 Today, the paintings of Velázquez stand out as those of one of the great masters of painting in Europe. But he was by no means the only major painter in Spain at that time. It truly was a Golden Age. Posted in General, Life, Painting and tagged Carducci, Carducho, Herrera, Murillo, Pacheco, painting, Spain, Velázquez. Bookmark the permalink.